In 12-inch skillet, place turnips in single layer. Add enough water to cover two thirds of turnips (to a depth of about 1/2 inch). Add butter, sugar, salt and pepper. Heat to boiling; reduce heat to low. Cover; simmer 5 minutes. Increase heat to medium-high. 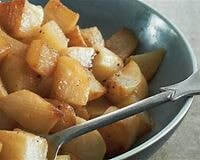 Cook uncovered 30 to 32 minutes or until water is evaporated and turnips are browned. Add 2 tablespoons water, stirring to loosen particles from bottom of skillet. Cook 1 minute longer or until turnips are glazed.